Re: Running GIMX on CHIP! A device name is empty. Multiple mice and keyboards are not managed. GE_RegisterJoystick has to be called before GE_initialize. The first wrong thing is to use the root account. Isn't there a user account on the CHIP? The log says GIMX accepted a connection from a Dualshock 4, but that the connection to the PS4 was refused. This may be a pairing problem. Did you pair the bluetooth address of the CHIP with the PS4? Note: this is using CHIPs internal bluetooth. No USB BT dongles were used. I tested root since running the shell script gimx-ps4-helper.sh expects /root/.gimx/bluetooth... I also started gimx from the command line as chip with the same results. Using a DIY USB Adapter (Leonardo clone, CP2102 & powered hub) with CHIP & PS4 works well enough with a XArcade Dual Stick to play Ultra Street Fighter IV even with lightdm xwindow running which auto logins. I disabled the bluetooth manger (blueman-applet) inside autostart Computer Things->Settings Manager->Session and Startup->Application Autostart. I might consider autostart for gimx. I also used the GUI to pair DS4 too. When launching gimx the DS4 LED stays solid white after hitting the PS button but the connection times out as soon as I hit any WASD input keys. I guess I need to experiment some more or settle on using a supported dongle. Last edited by Tom on Thu Jul 12, 2018 2:27 am, edited 1 time in total. Using the sudo command, the gimx-ps4-helper.sh can be run as a regular user with root privileges. I think some of the bluetooth management commands may not work the same as with a dongle based on the CSR8510. Good news, I received my CHIPs! I'll start investigating on the USB OTG and bluetooth capabilities. Keep reading the blog for further updates. Godspeed! I've been having fun using CHIP with Gimx. It made me start to think more about Player 2 options. 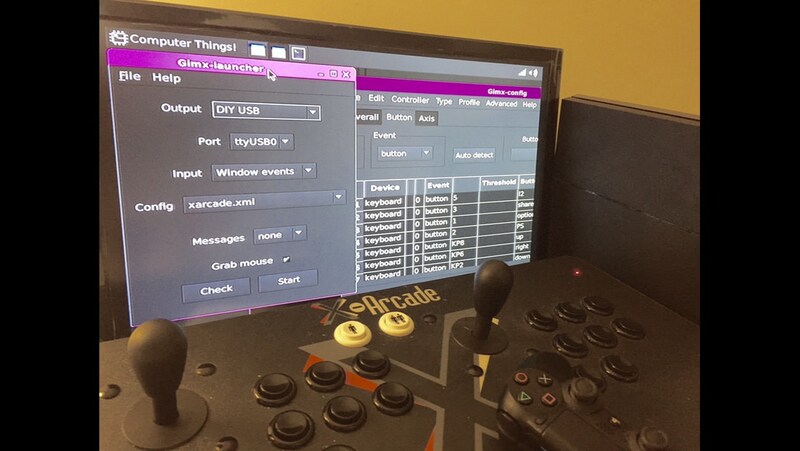 The X-Arcade dual stick sends keyboard commands for both sticks and buttons through a single usb connection. This is cool for twin stick shooter games. However if I was to use a console game adapter to convert X-Arcade to xbox / PS3 it would split the connection into 2 usb gamepads (no more keyboard). It's easier to picture running 1 CHIP, 2 gimx with 2 configurations with 2 /dev/ttyUSBx (or with BT dongles). Is there another way to picture getting player 2 in the mix? Obviously if we got USB OTG, the internal BT of Chip working, there maybe a way to fit player 2 in there using less hardware. Or use 2 CHIPs one to one. I guess there is a bunch of ways to think about it if you also have a DIY adapter. Any updates on the whole CHIP thing? Is it worth pre ordering one? What else would I all need to make g27 work with ps4? It's going quite slow due to Linux kernel issues. CHIP has all hardware capabilities required for each side of the adapter (USB host and device). The only limiting thing right now is software. Software issues on the Gimx side or the Chip side? Issues with the Linux kernel, which is the core of the OS. I made some progress and I should be able to use my CHIP as a USB proxy very soon. Making a USB proxy is the first step.